Dressed like Marty McFly paying a nocturnal visit on his adolescent father in Back to the Future, Brian Brown and Jackson Jennings shuffle along in their silver coats and hoods with plastic face shields, carrying 270 pounds of molten bronze as if it were the industrial version of Cleopatra’s golden litter. As they tip the glowing bucket, orange metal flows like lava into the gray-white ceramic casts wired in place in a steel pan on the cement floor. This is how Ronald Reagan got to the Capitol rotunda. Carolina Bronze Sculpture, hidden down a gravel drive past Maple Springs Baptist Church on the other side of I-73 from Seagrove’s famous potteries, may be the foremost artists’ foundry in the eastern United States. Certainly it’s the one most often used by Chas Fagan, the Charlotte artist whose statue of Reagan resides in the people’s house in Washington, D.C. The foundry is the life’s work of Ed Walker, 62, a quiet, unassuming man with a quick smile and a knack for noodling on an industrial scale. Walker is a sculptor, too. His Firefighter Memorial in Wilmington, North Carolina, incorporating a piece of I-beam from the South Tower of the World Trade Center, was completed in 2013, and he hopes to have the recently announced Richard Petty Tribute Park with multiple sculptures completed in time to celebrate Petty’s 80th birthday on July 2. One of Walker’s large abstracts is on its way to Charleston, South Carolina, on loan for a year’s exhibition. 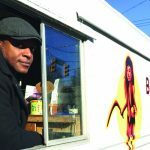 Walker grew up in Burlington, living in the same house — three down from the city park — until he graduated from Walter M. Williams High School and went to East Carolina University. His father, Raleigh, was a WWII veteran who developed a hair-cutting sideline to his motor pool duties in the 5th Army Air Corps. “There was a picture he showed me of this barbershop tent, and Dwight Eisenhower and Winston Churchill were standing out in front of it. They’d just gotten a shave and a haircut by him, and he was on the edge of the photo.” The same shears kept Ed’s head trimmed, too. 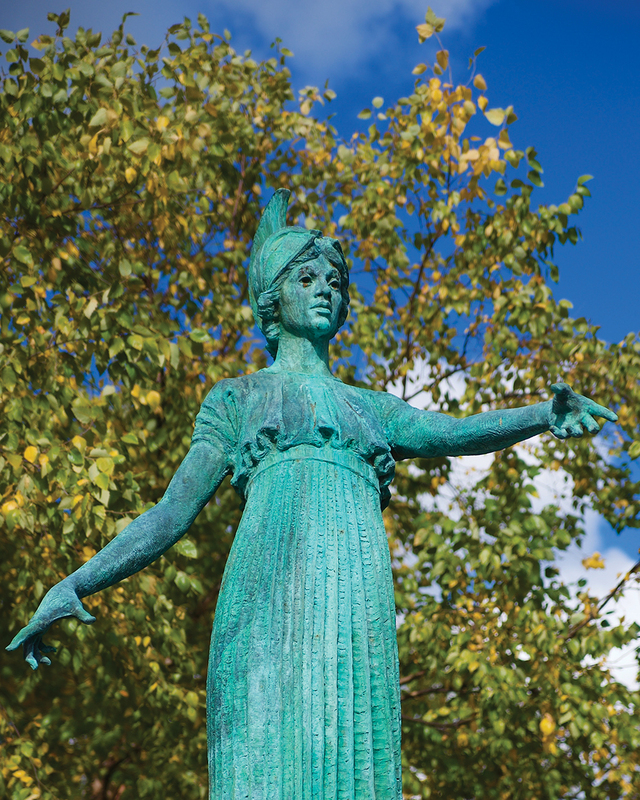 At 9 feet, James Barnhill’s Minerva (2003), towers over UNCG’s campus. Sculpture reared its head at ECU. “I took my first sculpture appreciation class with Bob Edmisten. Had my first little bronze casting from that class. They pushed everybody to explore. You could use or do anything. I fell in love with that. Started learning how to weld and cast and carve, the kind of range of things you could do.” In addition to getting a Bachelor of Fine Arts, Walker met his wife, Melissa, another art major, also from Burlington. “We knew each other in high school,” says Melissa. “She was in the good student end,” says Ed. “I was in the back with all the problem people.” The old art building at ECU was near the student center. She was going out. He was going in. They were pushing on the same door in different directions. By their senior year they were married. 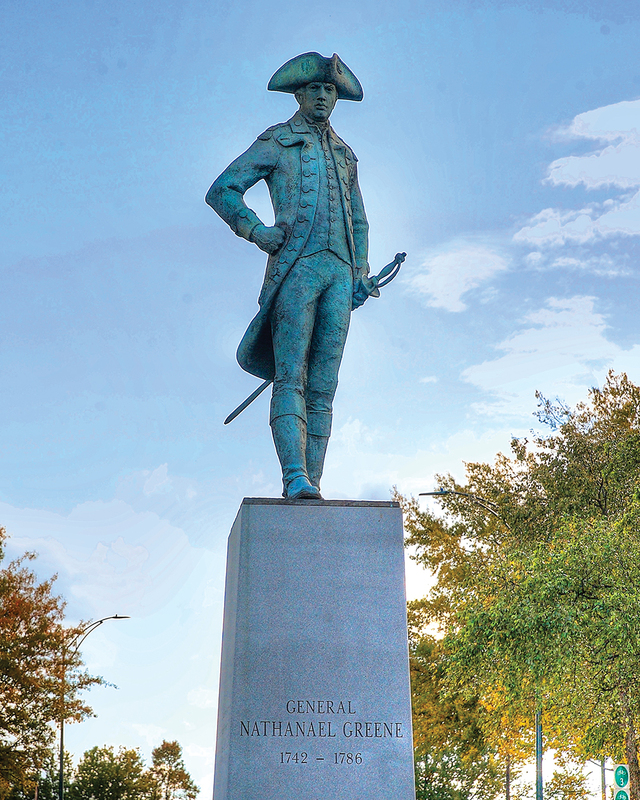 Cast in 2008, Nathanael Greene, by James Barnhill, oversees the roundabout in downtown Greensboro. The first stop after graduation was Grand Forks, North Dakota. If you’ve been to North Dakota, you know there are months and months of harsh winter followed by, say, Tuesday, which is followed by more winter. The University of North Dakota was interested in setting up an art foundry and offered a full stipend to the person who could do it. Walker had helped Edmiston put together the one at ECU’s then-new Jenkins Fine Arts Center. The professor recommended the student. North Dakota sent the Walkers a telegram — your grandfather’s instant messaging. Be here in two weeks. They were. “They had a new building and a bunch of equipment in crates,” says Walker. “Figure it out. Set it up.” Walker’s art history professor at UND was Jackie McElroy, better known today by the pseudonym Nora Barker, a writer of cozy mysteries, who reinforced his belief that you could figure out how to do just about anything if you wanted to badly enough. It became a recurring theme. Chased out of North Dakota with a master’s degree and a case of frostbite, the Walkers found themselves back in North Carolina trying to land teaching jobs. After traveling to a conference, essentially a job fair, in New Orleans, Ed and a friend, Barry Bailey, made a pact. If they didn’t have jobs in a year, they’d move to New Orleans. They didn’t and they did. The Walkers arrived on July 3rd, dead broke. They slept on the floor of the apartment of a friend of their friend, Barry. “We had no job to go to, no food, no money,” says Walker. The next day at a Fourth of July block party, he picked up some carpentry work building a Catholic church. It lasted the rest of the steamy Louisiana summer. The couple attended art openings, went to galleries, met people. Walker got a gig as a bartender at a private party thrown by a local sculptor, Lin Emery. “At the end of the thing, she gave us a tour of her home and her studio,” says Walker. A creator of high-end kinetic sculptures, Emery mentioned she’d just lost her fabricator and was swamped with jobs that needed doing. “Do you know anybody who knows how to weld aluminum?” she asked. “Well, I can,” said Walker. He’d never done it before. 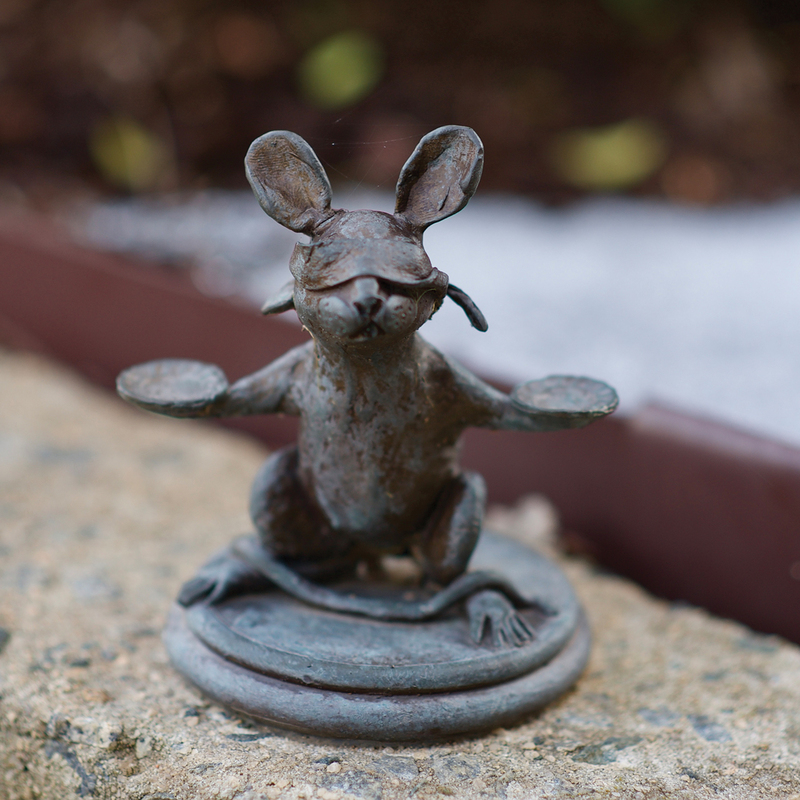 At 6 inches tall, Blind Justice at the Alamance County Courthouse is one of Ed Walker’s 11 whimsical sculptures of Arty the Mouse scattered throughout downtown Graham. 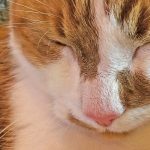 With a weekend to learn how to TIG (tungsten inert gas) weld, a professor friend introduced him to a guy in the maintenance department at Loyola University who offered to help. Walker showed up for work on Monday. “I did not confide to her that I lied my way into the job until about eight months later,” he says. He worked in Emery’s studio until — with Emery’s help — he was able to mix and match enough bits and pieces of teaching jobs to laissez les bon temps rouler. Part time at Loyola. Part time at Delgado Community College. Part time at Louisiana State University in Baton Rouge. Part time at Tulane University. Then, finally, a full-time job teaching sculpture at Tulane. “I had eight students,” Walker says of his first year. “In five years it went from eight students to 101 and eight sculpture majors.” But, as it turned out, Walker was more interested in sculpture than Tulane was. Fagan shares Walker’s penchant for figuring things out. He’s a 1988 graduate of Yale who majored in, of all things, Soviet studies. He took a couple of painting classes while he was in New Haven, and it turned out he had the one thing you can neither invent nor hide, talent. He says his work at the moment is mostly historical in nature. “I’m looking at a life-size seated James Madison. He’s in a 4-foot by 7-foot canvas,” says Fagan. While that commission was private, he had previously been hired by the White House Historical Association to paint all 45 U.S. Presidents. He did the portrait of Mother Teresa that was mounted on a mural and displayed during her sainthood canonization by Pope Francis. His sculptures include the Bush presidents, George H.W. and George W., shown together, and George H.W. alone; several versions of Reagan for Washington, D.C., London and Reagan National Airport; Ronald and Nancy Reagan for his presidential library; Saint John Paul II for the shrine in Washington, D.C.; and Neil Armstrong for Purdue University. The piece currently being produced at Carolina Bronze is a sculpture of Bob McNair, the owner of the NFL’s Houston Texans. Fagan’s start in sculpture was, in its way, as unusual as studying Russia to master oil painting. While he was at the White House working on Barbara Bush’s portrait, he was asked if he could do a sculpture of George H.W., too. Sure, he said. Fagan had never done one before. Now the path to many of his finished pieces passes through Carolina Bronze. “In this place I think we created a really nice marriage of modern technology and old school techniques that have been around for thousands of years,” says Walker. David Hagan, a sculptor himself who works mostly in granite and marble, will produce a 360 degree scan of the piece, a process that takes about a day. That digital information is fed into a machine that cuts pieces of industrial foam to be assembled into a rough version of the sculpture at its eventual scale. “It’s at that point that I come in with clay and sculpt away,” says Fagan. “You’re at your final size and it’s a fairly close version of what you had, which may or may not be a good thing. What looks so great at a small scale may end up being not so great. You can have awful proportion things wrong. The foam that’s used is a wonderful structural foam that you can slice with a blade. For me, you can sculpt that stuff.” The eventual layer of clay on the foam varies according to the artist’s desire. Solid bars of wax, sprues, are added to the wax pieces to allow for the passage of molten bronze and the escape of gases. A wax funnel is put in place. Everything is covered in what becomes a hard ceramic coating. That’s heated to around 1,100 degrees. The wax melts away. 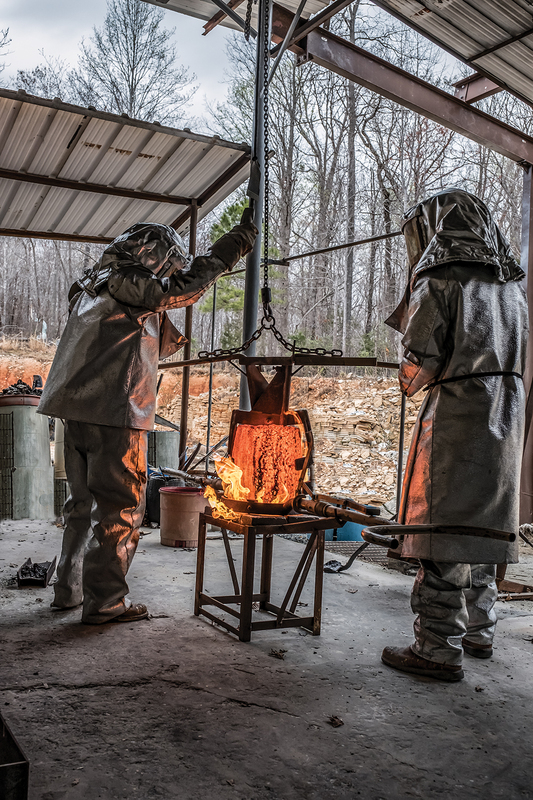 Brown, who has a Bachelor of Fine Arts degree from UNCG and whose own bronze sculpture of a mother ocelot and kittens will go on display at the North Carolina Zoo this year, slags the impurities off the top of the molten bronze. It’s poured at roughly 2,100 degrees. “I found that I enjoyed the more physical aspect of working with sculpture as opposed to doing drawings or paintings,” says Brown. After everything has cooled and the ceramic is broken away, the pieces need to be welded together to reform the full sculpture. “The weld marks on the metal, you have to fake to look like clay,” says Fagan. The artist oversees that, as well. “The bronze shrinks but not always at the exact same percentage. There are always adjustments.” The last step is applying the patina, one of a variety of chemical surface coatings, done at Carolina Bronze by Neil King. Different patinas are chosen for different reasons: if the piece is to be displayed in the elements; if it will be touched frequently; and so on. “For someone like the artist who is very visual, it’s hard to imagine what the end result is going to be when you see the process. It will just look completely different in the middle than it will at the end. It’s an absolute art,” says Fagan. When it’s finished, no one knows the structural strengths and weaknesses of the sculpture better than Walker. They crate it like swaddling an infant, put it in traction, and then ship it off. Jim Moriarty is senior editor of O.Henry’s sister publication PineStraw located in Southern Pines, and can be reached at jjmpinestraw@gmail.com.